When it comes to getting information direct from the source, it doesn’t get much better than this. 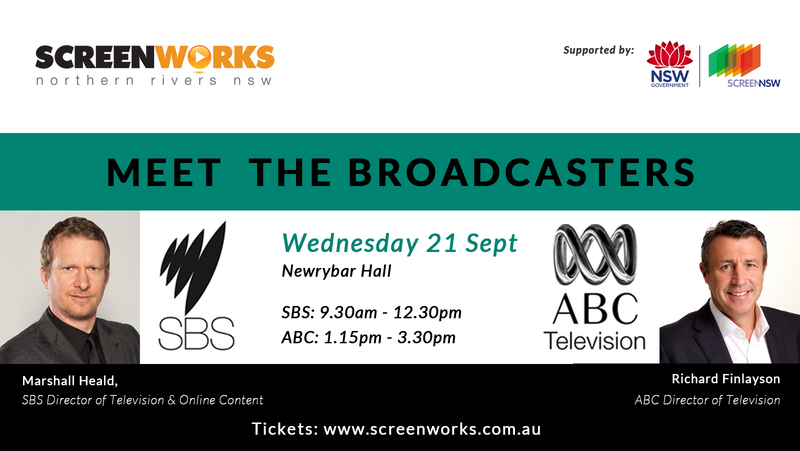 Creatives in the Northern Rivers will have the chance to get one step closer to seeing their projects broadcast on our national television networks, all thanks to Screenworks bringing senior executives from the ABC and SBS to our region for a not-to-be-missed Meet the Broadcasters event. On 21st September, SBS Director of Television and Online Content, Marshall Heald and ABC Director of Television, Richard Finlayson will travel to Newrybar Hall to speak to local creatives about each of their networks’ content priorities, how their commissioning processes operates, and broadcast opportunities. “By understanding what our broadcasters are looking for, our local content creators, writers and producers will be able to better tailor their concepts to help secure broadcaster interest, or alternatively to generate new ideas that specifically meet broadcaster needs and opportunities,” explained Screenworks General Manager, Ken Crouch. “It can be very frustrating for our local creatives to spend a lot of time developing a project only to find that it is not relevant to the broadcaster’s program requirements or simply not what they’re looking for at the moment. This event is crucial to informing our region’s content creators of future opportunities and gives unprecendented access to industry information” said Mr Crouch. Two episodes of the recently broadcast Barracuda were written by Mullumbimby resident Belinda Chayko; The God’s of Wheat St was written by Casino-based Jon Bell and filmed in the Northern Rivers; Mullumbimby writer Roger Monk who wrote for Nowhere Boys, The Doctor Blake Mysteries and five episodes of East of Everything, which he also co-produced is currently a development producer at Essential Media and Entertainment; dirtgirlworld was created and produced locally by Whiporie residents Cate McQuillen and Hewey Eustace; Miss Fisher’s Murder Mysteries and East of Everything was co-written by Byron Bay-based Deb Cox. Meanwhile on SBS, the Goa Hippy Tribe was directed by Byron Bay resident Darius Devas – just to give a few examples. Each of the senior executives speaking at the Meet the Broadcasters event will present on what their networks are looking for, participate in facilitated Q & A sessions, as well as join in round table discussions and listen to pitches. The event will be facilitated by local screen industry distribution expert, Victoria Baldock. Meet the Broadcasters is one part of Screenworks’ 2016 Pitching Program designed to help local creatives pitch their film and television ideas in order to secure interest from broadcasters, producers and investors. Other events in this year’s pitching program include Prepare to Pitch – a workshop on how to prepare key pitch documents (being held on Tuesday 6 Sptember). Screenworks is also offering to take selected projects from the region to seek market and producer interest at this year’s Screen Producers Australia conference in Melbourne in November.